This veteran trainer explains why the new format for this year’s USHJA International Hunter Derby Championships will make the competition better than ever. At this year’s U.S. Hunter Jumper Association International Hunter Derby Championships, Aug. 15-17 at the Kentucky Horse Park, we’ll be initiating a tier system that ranks riders based on their lifetime earnings in the derby program. While some may be skeptical of this change, I’ve seen firsthand how some of these concepts have taken off in the reining world and can translate to big improvements in our hunter community. We’ve talked about limiting riders to a certain number of horses in derbies for a while, and the idea has pros and cons. But we first want to see how the tier system at these championships will affect the number of horses the riders compete. We feel this new system will create new business strategies that will help both our leading riders and our younger professionals. With this new format, we’re not taking anything from anyone’s plate—we’re adding opportunity for others; every rider will have the opportunity to make it to the top-level final. But we’ve also added a second level to recognize additional owners and riders. And with the add-back element, there will be more money than ever to go around. This format will encourage more strategic thinking. Owners and trainers who use a Tier I rider with a lot of horses may start to recruit a Tier II rider to take on a horse or two, as that rider has a possibility of winning more money for their owners. The rider-ranking list will be based only on derby money earned; there are lots of extraordinary riders out there who aren’t currently ranked in the top 20 because of their choice of business, not because they can’t make it happen or they don’t have good horses. One important thing to emphasize is that the more involved people are in the program, the more return they’ll have on their investment. Quality will always come to the top, and you’ll maintain the integrity of the sport by being inclusive—you won’t lose it. That’s what the producers of our sport have to remember. Don’t worry that we’ll get too many. Yes, you have to learn how to manage the numbers, to protect the welfare of the horses and design a system where the best come to the top. But this is the best way to get people involved and find your best owners, horses and riders. I think this is important for both our derby and pre-green programs. This year all riders will compete in the Classic Round. A minimum of the top 20 horses will return for the Tier I Handy Round, regardless of the rider’s classification. A minimum of the top 20 Tier II riders who aren’t qualified for the Tier I final will advance to the Tier II Handy Round. Combinations not qualified for either handy round will compete in the Consolation Round. As the chairman of the USHJA International Hunter Derby Task Force, I’m really proud of what we’ve done so far—we’ve given away more than $4,000,000 in derby money and created so much excitement in the sport of show hunters. That’s huge.We’re constantly trying to re-evaluate the program and make sure it’s serving the sport well. We keep hearing complaints about a few top riders dominating everything. We don’t want to take anything away from those riders—they’re very talented, and the sport needs to have heroes in the spotlight. 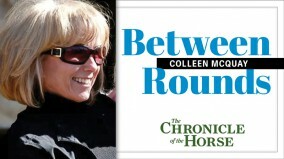 But we need to encourage the up-and-comers, too.Luckily Colleen McQuay had experience addressing similar situations in the reining world, and that world has really blazed the trail and tested out this format. I’m so thankful to her for sharing her journey. She’s a wonderful horsewoman and person, and we’ve really benefited by being able to use her knowledge.We’ve had an eye on this for several years and, as she noted, we’ve talked about the possibility of limiting the number of horses each rider may compete. But there are problems with that solution, and we want to see if this tier system will address those concerns in a better way. I think we’ll see Tier I riders and their owners recruiting Tier II riders strategically. As a committee, we’re recognizing that we’re not just the super-elite end of the sport, but it’s our job to listen to input from everyone and figure out what’s best for the industry. The majority of people, once they get their head around the new system, grasp it and like it. But we also need to be patient with the new format; it may need some tweaking down the road. Things continue to get better. Throughout the evolution of this program, we’ve seen the quality of the horses and competition improve. In the first years we had a lot of equitation horses and jumpers mixed in with the hunters, but as the years have evolved, we could see true hunters really starting to dominate. We’re seeing horses being trained as derby horses, which is really exciting to see. We’ll continue to evolve. In this 2013-2014 season we’ve introduced an enrollment component. You don’t have to pay to nominate your horse if you just want to show in a derby once for fun, but if you pay the $200 fee, 60 percent of that money will go back to regional awards, which will be distributed to the leading owners in each region at the end of the year. I feel as a task force we’re really reaching out to try to give back to owners who have been supporting the program. You could have a situation where a Tier I rider finished 21st in the classic round, and that rider wouldn’t be eligible for the Tier II Handy. He or she would be eligible to compete in the Consolation Round. The Tier I Handy pays 75 percent of the total prize money, with 25 percent being paid in the Tier II Handy. The total prize money is a combination of the base amount of $100,000, plus 80 percent of each entry fee. This means that for every horse entering, an additional $600 will be added to the base amount of $100,000. This doesn’t mean that anyone is riding for less money. Tier II riders will have the ability to win top money if they beat out Tier I riders in the Tier I Handy, and they’ll also be eligible for a separate purse restricted to Tier II riders regardless of which handy they ride in. In my experience in the reining world, this gives a big boost to young trainers or to trainers who haven’t been participating a lot in the program, and it gives them more value when they sell themselves as trainers. We look forward to having a great derby championship. It’s my hope that everyone will realize what my husband Tim and I have already learned firsthand. These programs work, and we have to challenge ourselves to find new, innovative ways to keep our sport relevant and to sustain it well into the future. This year we’ll debut the USHJA Pre-Green Incentive Championship for two days before derby championships. This will be the culmination of the year-long series of Pre-Green Incentive Stakes classes. We started this program in 2012 in Texas, and it was super successful, and we’ve learned from what we did there to take the program national. We tried to keep the program really simple and easy so we didn’t stress horses or people. Horses just had to be enrolled and compete in two classes during the year to qualify for the championship, where we’re giving away a huge amount of money—as of July 16, the prize money stands at $104,365, and that will continue to grow as entries come in. That money comes from an enrollment program and entry fees, not sponsorships, so it’s self-sustaining. We saw in Texas that many horses were able to pay their way to the Final because it pays so deep. I know these new formats can be confusing to the hunter world, but they’ve worked really well in the reining world. We’ve seen how exciting it can be and how many people will get the opportunity to campaign their young horses in a real championship appropriately and inexpensively. This ties together the breeders, owners, trainers and riders, and it helps bridge a very important gap. The series and championship are a great way to give exposure to up-and-coming trainers who might have to sell horses before they get to the open divisions. Colleen McQuay operates the hunter/jumper, reining and breeding operation McQuay Stables Inc. in Tioga, Texas, with her husband Tim. A 2010 Alltech FEI World Equestrian Games team gold medalist, Tim has earned nearly $3 million as a reining professional, and their daughter Mandy has earned more than $1 million as a non-pro rider in the National Reining Horse Association. Colleen has shown and trained horses and riders in both disciplines to U.S. Equestrian Federation and American Quarter Horse Association titles. She developed and helps run the National Reining Breeders Classic, a program that produces the highest added money event in the industry. She is a member of the group that created the Legacy Cup, as well as the U.S. Hunter Jumper Association Hunter Derby. She currently co-chairs the USHJA Hunter Development Task Force and sits on the USHJA Board of Directors, as well as serving on the USHJA International Hunter Derby Task Force and the USHJA Hunter Working Group.